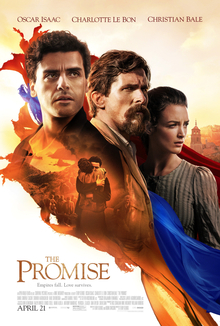 ‘The Promise’ is a film that attempts to tell the story of the Armenian Genocide at the start of the First World War, an atrocity that to this day is not acknowledged by the Turkish government. It’s directed by Terry George, who also helmed ‘Hotel Rwanda’, and both films cover similar heartbreaking content, although ‘Hotel Rwanda’ is undoubtedly a better film. The film begins in the final years of the Ottoman Empire, just before the genocide begins, and our insight into the political events comes through an Armenian apothecary (Oscar Isaac), an Armenian woman who knows his uncle (Charlotte Le Bon) and her partner, an American journalist (Christian Bale). One of the main factors that hurts ‘The Promise’ is in its attempts to move between a harrowing war drama and a soapy, melodramatic love triangle, and the two strands sit uncomfortably alongside one another. It’s a shame, because the performances are really strong from the leading trio, and there are also brief but memorable turns from the likes of James Cromwell and Rade Šerbedžija. The film does spend a lot of time building its characters and its story, but it’s to the detriment of plot propulsion which is slow and ponderous until the final half hour when the stakes are upped. I don’t expect, nor want, films to be history lessons, but ‘The Promise’ is a film that could have benefited from focusing more on the history and letting it flow through the characters, as opposed to the time and effort spent establishing a love triangle that is infinitely less compelling. I really wish ‘The Promise’ was a better film, because this is an important story and the film is undoubtedly well intentioned, but the overall package never quite coalesces into a satisfying whole. I’m glad I saw it and I hope it does well, because this is a piece of history that deserves to be known by a wider audience, but it feels like a missed opportunity to an extent.